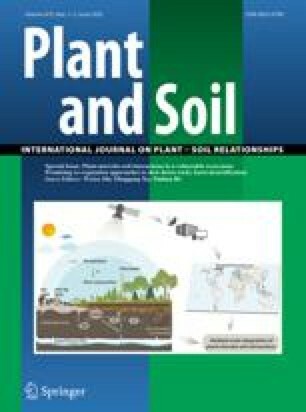 In order to assess the potential impact of long-term sewage sludge application on soil health, the equivalent of about 25 years of agronomic applications of low-metal (`EQ') sewage sludge products were made to greenhouse soil columns. After a 6-year period of `equilibration', during which time successive crops were grown with irrigation by simulated acid rain, the plant-available quantities of trace elements were estimated in the soils by extraction with 0.01 M CaCl2 at 90 °C, and measured directly by uptake into a crop of red clover (Trifolium pratense L.). Soil pH had a strong influence on the level of extractable and plant-available metals, and because the tested sludge products affected soil pH differently, pH was directly factored into the comparison of different sludge treatments with controls. CaCl2-extractable levels of several metals (Cu, Zn, Mo), sulfur and phosphorus were found to be higher in the soils amended with organic-rich sludge products than in the control soils. However, extractable Cd and Ni were not significantly elevated by the sludge amendments, presumably because of the low total loading of these metals. Copper, Zn and Mo applied in the form of sludge ash had low soil extractability, suggesting that these trace metals were trapped in high-temperature mineral phases formed during sludge incineration, and resisted subsequent weathering in the soil environment. Extractable soil metals in the alkaline-stabilized sludge treatment were also generally low. Phytotoxicity from the sludge metal loadings (Zn≤125, Cu≤135 kg/ha), was not clearly indicated as long as soil pH was maintained in the 6–7 range by lime amendment. Nevertheless, unexplained depressions in yield were noted with some of the sludge products applied, particularly the dewatered and composted materials. On limed soil columns, the most consistent effect of sludge product amendment on red clover composition was a marked increase in plant Mo.